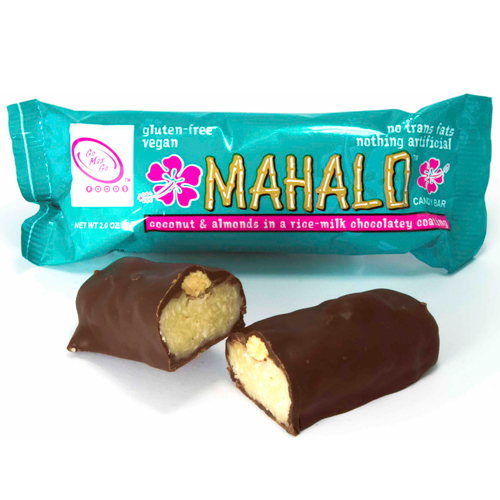 If you crave a gently sweetened coconut candy bar topped with three whole dry roasted almonds and covered in a luscious chocolatey coating hang loose, the Mahalo™ bar is for you! 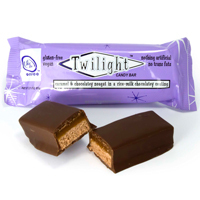 This is quite possibly the best vegan candy bar we've ever tried. Even if you are not vegan or dairy-free, you'll love that this decadent bar contains no trans fats, no hydrogenated oils, no cholesterol, and nothing artificial. A natural rival of the Almond Joy Bar. Ingredients: Desiccated coconut, organic unrefined cane sugar, organic rice syrup, palm kernel oil, rice syrup, organic agave syrup, cane sugar, almonds (dry roasted), cocoa powder (natural), palm oil, natural flavors, sunflower lecithin, enzyme modified soy protein, salt. Additional information from the manufacturer: All equipment thoroughly cleaned before products are run. Contains NO corn ingredients, however, corn ingredients are processed on same equipment. I've never had an almond joy, but this bar is good. It's pretty high in calories and fat 280 and 16 grams, 80% of the recommended daily value, this is quite a lot! I would say its my second favorite bar by Go Max Go, first being jokerz. As long as you don't eat these regularly they are a good treat! Tastes better than an almond joy!!! The BEST Vegan Bar Yet! It is my no. 1 treat CURRENTLY on the market for us Vegans! and I am PICKY kitty! YES! It is similar to Almond Joy with way better flavor and not as sweet! and no junk in there! Plus the name Mahalo is AWESOME! (It's Hawaiian for "thanks, gratitude,admiration, praise, esteem, regards, respects..." Wikipedia def.) A sweet way to repect where your ingredients come from and respect what you put into your body! Unbelievably good!!! I cant keep away from these yummy candy bars. I definitely will be ordering these again and again!!!! These bars a DELICIOUS, but would be even better if not as sweet, and if they were made with ORGANIC ingredients! I wonder if the company plans to eventually make it with organic ingredients?